Takeshiba Kisui's drama "Kami no Megumi Wagô no Torikumi" was premiere in March 1890 at the Kiriza [more details]. Takeshiba Kisui received the help of both Kawatake Mokuami and Kawatake Shinshichi III for the writing of some acts. The core of this drama was a real event, a spectacular brawl between a group of sumôtori and a group of tobi. This big fight occured in the 2nd lunar month of 1805 near the Shiba Shinmei Shrine. The original drama was made up of 4 acts divided into 13 scenes. The current version is made up of 4 acts divided into 9 scenes. The popular sumôtori Yotsuguruma Daihachi has been invited to a party by one of his patrons at the geisha restaurant Shimazaki-rô in Shinagawa. The party becomes rowdy and one of the drunken sumôtori loses his balance and falls against the sliding paper door partition, which falls into the adjoining corridor. It strikes the tobi Shibai-chô  Fujimatsu, a member of the Megumi (the "Me" group, one of the 48 firefighting brigade in Edo) and one of the guests in the next room party. Quick to fight as all tobi traditionally are, Fujimatsu dashes into the room to complain. The swaggering sumôtori refuse to apologize and their insulting arrogance increases Fujimatsu's anger. A big fight is about to start when the tobigashira Tatsugorô, the boss of the Megumi, appears. Tatsugorô tries to diplomatically mediate between the sumôtori and the tobi groups but they keep on flinging insults at each other. Unwilling to cause any further trouble to the Shimazaki-rô, Tatsugorô orders his men to withdraw. They grumble but comply with his order. However, Tatsugorô himself has become so incensed at the insulting attitude of the sumôtori and their patrons. He silently vows revenge. Late that same night, just before dawn, Tatsugorô is stealthily waiting for Yotsuguruma at Yatsuyama, a place not far from Shinagawa. When Yotsuguruma comes by on his way home, Tatsugorô dashes out to kick out the lantern of Yotsuguruma and fights him in the dark but the sumôtori is stronger than the tobigashira. 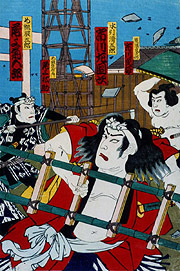 The fight is interrupted by the arrival of a palanquin carrying Kitadashi Kisaburô, an influential local boss. Tatsugorô slips away but accidentally drops his tobacco pouch which is picked up by Kisaburô. It is spring and a popular Kabuki troupe is performing at a small playhouse in the precincts of the Shiba Shinmei Shrine. The popular Megumi tobi led by Tatsugorô are responsible for keeping the peace in this area. Tatsugorô's wife Onaka, who happens to pass by with her small son Matahachi, notices the arrogant attitude of the tobi. She hopes that it will not drive them to start a brawl. After resting a while, she goes home with the boy. A moment later a commotion is heard from the playhouse and a couple of tobi throw out a drunkard who had proved himself a nuisance. But now some sumôtori intervene on the side of the drunkard. A fight between the tobi and the sumôtori quickly ensues. Tatsugorô, who happens to pass by, pushes his way toward the fight to admonish his men, but when he finds that their adversaries are the sumôtori Yotsuguruma Daihachi and Kuryûzan Namiemon, he acts belligerently toward them too. A big brawl is about to ensue, but Edoza Kitarô, the playhouse proprietor, comes running out to ask them to withdraw in order to let the audience enjoy the play. Once again, Tatsugorô is forced to curb his anger and put off the fight until another day. The situation between the sumôtori and the tobi has reached the point of no return. A big fight is inevitable and Tatsugorô himself has resolved to fight to death. He goes to meet the influential local boss Kitadashi Kisaburô to falsely say that he is going on a pilgrimage. He asks him to take care of his family if something should happen to him on the road. 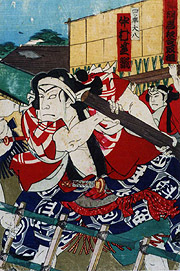 Kisaburô, who had witnessed Tatsugorô's unsuccessful attack on Yotsuguruma at Yatsuyama, guesses Tatsugorô's real intent and tries to talk Tatsugorô out of the folly of carrying out the fight. 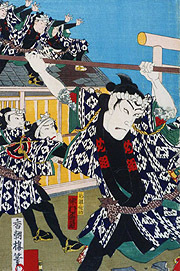 In the meantime Tatsugorô's men are busily preparing for the fight at Tatsugorô's home in the district of Hamamatsu-chô. They are polishing their firefighting tool, which will be their weapons against their enemies. Tatsugorô returns home. He is quite unlike his usual self and seems to have drunk too much. He pretends to have forgotten all about the imminent fight and says that he needs to take a nap. Tatsugorô's wife Onaka can't understand the sudden strange change in Tatsugorô's attitude and she accuses him of passivity and cowardice in trying to avoid the fight and refusing to protect the honor of his men. When Tatsugorô continues to bluff, Onaka loses patience and angrily says she won't be the wife of a coward. Tatsugorô angrily writes out a letter of separation. The truth is that this is just the way he wants it. In spite of all, he is determined to go ahead but he wants to keep his wife and child free of any trouble that may result from his future actions. The only way is therefore divorcing Onaka. He asks for a cup of water and offers it to his wife and son. This is the traditional farewell. But now the drums announcing the end of the day's sumô matches can be heard. This is the signal waited for. Tatsugorô's attitude entirely changes. His strategy was to keep his men from jumping the gun and starting a fight before the sumô arena is clear of any fan. Now that the matches are over, it is time to go on the warpath. Onaka sees her familiar Tatsugorô again and proudly helps him in his preparations. Then she tears the divorce note to strips. Onaka and Matahachi see Tatsugorô off at the entrance. Tatsugorô realizes he may not see them again. The Megumi tobi are assembled on the street near the Shiba Shinmei Shrine. Tatsugorô comes running up to join them. They go through the ritual of exchanging farewell cups of water in an act symbolic of their determination to fight to the death. In the meantime the sumôtori are going through similar preparations on the street before the sumo house. They've heard of the tobi's plan to attack them there that day and they are all ready. The tobi Megumi group marches to the sight and the tremendous brawl starts. The acrobatic and dynamic tobi against the heavy and powerful sumôtori. The quick-moving tobi against the slow-moving sumôtori. Kisaburô comes hurrying to the scene and orders them to halt the fight, flaunting his coat as sign of his authority. The tobi pay him no heed. Finally the courageous and determined Kisaburô steps into the middle of the fight and says that they may continue to fight only over his dead body. He shows two haori, one with the mon of the tobi and the other with the mon of the sumôtori, claiming that he can speak for both sides. The fighters, in deference to Kisaburô's courage and strength of will, agree to a truce. The fight is over. Shibai-chô is an old Edo district name. It corresponds to the current 5th and 6th districts of Shinbashi in Tôkyô. this scene is often ommitted.